250ml bottle - specially made for phenolic balls. Apply a drop of Aramith Restorer upon the ball. Rub well (with an Aramith Micro-Fibre Cloth). Specifically for use with very dirty balls with hard to shift marks. This liquid has been developed by SALUC SA, the Belgian billiard ball manufacturer. It has been specially conceived for extra powerful cleaning of hard to remove spots on Aramith phenolic balls. 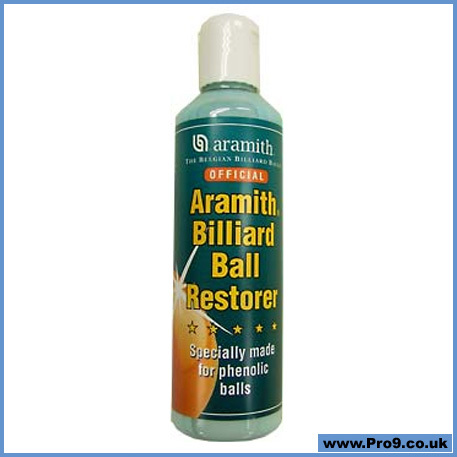 After cleaning, use Aramith Billiard Ball Polish to shine the cleaned balls, (ideally after each game). With this programme you will keep your Aramith phenolic balls polished, lustrous and antistatic throughout their exceptionally long service life.